Core Exercises Key to May’s Mental & Physical Rehab! May is a 3-year-old spayed, female Chihuahua mix. She had surgery at our hospital this past November for a luxating patella (sliding kneecap). While this is a common issue in small dogs (they can be born with it), this was not the case with May. She had normal knees until she had an accident while playing with another dog. At the time of surgery, radiographs were taken and she actually had slight abnormalities in her knees that predisposed her to patella luxation. The groove that the patella sits in was very shallow and the point where the patella tendon inserts onto the tibia was medial (closer to the groin side of the leg) than it should have been. Normally the patella tendon inserts on the tibial tuberosity on the very cranial or “front” of the tibia. These two, mild malformations did not provide enough tension on the tendon and therefore the patella luxated out of place. This will often happen when a pet is running and you will see them skip on that leg. Then, by extending their knee, the patella will slide or pop back into place. The more severe the malformations the more they will slide in and out. Very mild problems may not be noticed or may just need rehabilitation and joint protectants. More severe cases will put strain on the cartilage that lines the patella and the femur which will lead to arthritis. It can also cause discomfort and pain and not allow dogs to be active and happy. In the most severe cases, it can cause them not to use the leg at all (if the kneecap is permanently out of place) or will cause such tension on the knee that other structures (most commonly the cruciate ligament) will tear. Back to May. Her luxation was moderate and there was a traumatic component. This meant that part of the supporting joint capsule, fascia (connective tissue), and muscles had been stretched. Therefore, she needed surgery. During surgery, three things were done to correct her luxation: First, the trochlear groove was deepened using a drill and burr. This allows her kneecap to be seated better in the femur. Second, the stretched and partially torn supporting tissues were repaired to provide tension and hold the kneecap in place. And finally, a tibial tuberosity transposition (TTT) was done. Here the tibia (shin bone) where the patella tendon inserts was elevated slightly and rotated from the side of the bone to the front. A small orthopedic wire was placed to hold the bone in its new location as it healed and would then be permanently attached there. Surgery and anesthesia went very well with May and she was sent home the next day. It is common that they will not use the leg for a few weeks. The dynamics have changed and they need to adjust to that. During this time they are on pain relieving medications and have exercise restrictions since the bone needs to heal. Two weeks after surgery, May returned to have her skin sutures removed. At that point, she was using the leg well and was full of energy. It can be challenging to keep them restricted after surgery. The owner was doing range of motion exercises and slow leash walks to encourage weight bearing. I first met May ten days after suture removal. She was sore and was limping on her operated leg. The knee felt fine but her muscles in the thigh and lower back were uncomfortable. She tried to bite me a few times. I wasn’t sure if this was her nature or because she was in pain. I started her on muscle relaxants and added back her anti-inflammatory medication. She felt better a few days later and I didn’t see her for three weeks. At that point, she was using the leg better, but not as well as I had anticipated. The owner reported she was hard to keep quiet and was jumping on and off furniture. I advised against this and we planned to sedate her in two weeks to see if the bone had completely healed. May tried to bite me again that visit. Two months after surgery, May was sedated and radiographs were taken of her right knee. It showed that the pins and her kneecap were in place. It also showed that the tibial tuberosity (part that during surgery had been elevated and moved) had partially healed but also partially fractured. However, it was still in place, which was good. I always examine my patient’s when they are sedated it allows me to feel them while they are not guarding a painful area. In comparing the radiographs with my exam I knew that no other damage had been done to her knee and the fracture was not moving, so that no revision surgery had to be done. I discussed the situation with her owner. We had a very young, active dog that was having issues with exercise restriction. My suspicion was that while she was jumping on and off the furniture she had snapped that tiny part of her tibia. Even though the rest of it was healing well, if she continued to do high impact exercise, the bone would not heal and the pins holding it in place would start to vibrate and move. If this happened, she would need surgery to correct the problem and remove the pins. We had a dilemma. May clearly felt well, but being overly active was part of her problem. We needed an environment where May could be active but not do further damage. Putting her in a splint or cast at this point was not needed, and being overly confined can, in some cases, reduce bone healing. We needed to promote bone healing, but safely. I suggested that May come twice a week for outpatient rehab sessions. They would include underwater treadmill, cavaletti rails, and balance/core exercises. We could use the cold laser on her muscles and back but had to be cautious around the tibia. While the laser can promote bone healing it can also heat the metal pins and cause damage to the bone. This would only happen if the laser was left in one particular spot for prolonged periods of time but it was something we had to be aware of. Mom was on board with this idea and we started later that week. May wore a life jacket and did fantastic in the underwater treadmill. 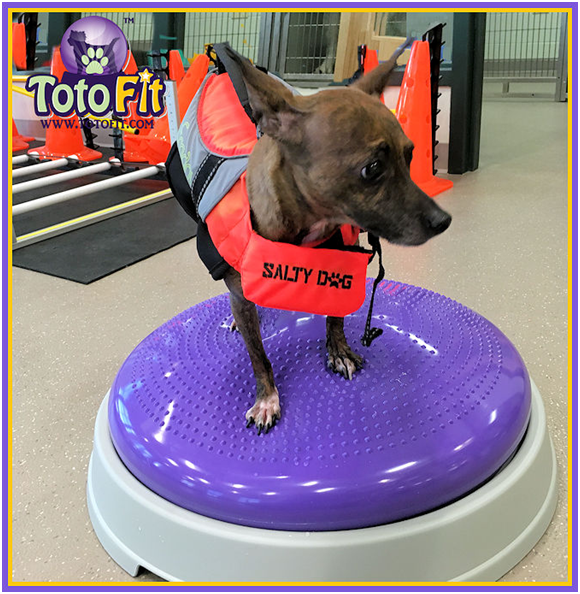 The jacket has a handle and this helped us to balance her on the Toto Fit equipment to work on core exercises. May didn’t like to be touched directly, but with the handle of the life jacket we could shift her weight slightly and help to strengthen her postural muscles by having her shift against us. The handle also facilitated a great approach to having her walk through the cavaletti rails. She got this exercise done nearly instantly and would change direction on her own at the end of each pass to head back the other way. May also did great during her laser treatments. With each passing session, May became more acclimated and energetic about her session. She readily ran up the ramp into the treadmill and wagged her tail. 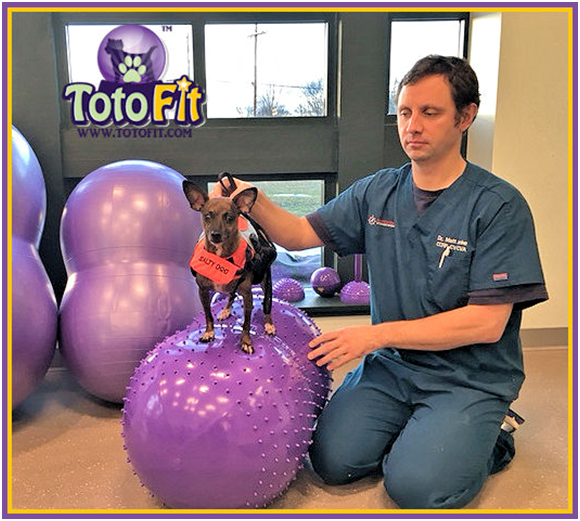 She would bounce on the Toto Fit Core Disk and wait for us to challenge her balance. Her tail constantly wagged. May had fun with her rehab. Over the course of six weeks, May progressed from 20 minute walks to 60 minute walks. She went from 1-2 minutes on the balance work to 5-10 minute sessions. We incorporated different exercises with the Infinity, TotoPAWDs, disk, and cavalettis to give her a bit of an obstacle course. She did great through six weeks of rehab (12 sessions total) and today we took new radiographs and her bone is healed! Her muscle mass has increased, she’s pain free, happy, and hasn’t tried to bite since we started rehab. Her nipping I associate with pain or frustration from not walking properly. It takes a team approach to get success. From her surgery to her final outcome, the balance between doctors, nurses, owners, and patient has to be harmonious. Having access to the right knowledge and equipment to achieve our goals helps too! Thanks for sharing your experience rehabilitating May from her surgery. It’s great that she was able to go to outpatient rehab sessions to help with her condition following her surgery. Having her walk on caveletti rails seemed to have helped her a lot. My dog is also very young, so I want her to be able to live an active life after he’s out of surgery. I’ll consider taking him to rehab so that he can live a full life.